If you are looking for an evening of great music in a relaxed, friendly environment with good company and some excellent beers and wines. Then the Shirley Folk Club might be just for you. Doors open at 7.45 for an 8.00pm start. We pride ourselves on our relaxed atmosphere with great music. All meetings are performer’s nights with a featured guest who performs a 30-40 minute spot. 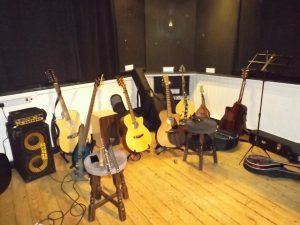 Come along and performer or listen and all styles of acoustic music are welcome – you will be assured of a warm welcome. It is an acoustic Club and the acoustics are excellent and the audience have come to listen.